Thanks for stopping in! I started my Barbie® collection around 1997, and stopped collecting around 2000. Didn't lose interest, life changed for me in general. 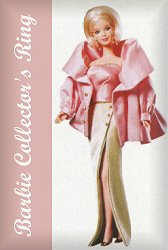 The first Barbie of my collection was the 1998 Dolls of World ~ Native American Barbie®. Being that I'm Native American from the Dine' (Navajo) Nation, I never imagined that Mattel would ever come out with the Dolls of the World collection featuring Native American dolls from different tribes! The most recent being a Navajo Princess doll that is so realistic, that I may just have to purchase one last time. Well, the time has come for me to rid of my collection. If you are interested, please email me and we can negotiate a price. I am also willing to sell ALL of my Barbie's to a single buyer. If you have any questions, please don't hesitate to email me. "Ahe'hee" (thank you in Navajo)! a part of this fun web ring. Copyright© 1999-2004 Native Barbie. All rights reserved. This site is an UNOFFICIAL Barbie® site. It is in no way affiliated with Mattel Corporation.